The standard cooker mixer for the confectionery industry for over 100 years stirs your batch while cooking, all under digital temperature control. The WARRIOR model has a spring-loaded scraper agitator with fixed breaker bar for most recipes. The CHIEF model has a unique counter-rotating second agitator for "double-action" on stiff recipes or those needing extra agitation. Both models available as a GAS or ELECTRIC cooker. The FireMixer is used every day around the world to cook fudge, caramel, toffee, brittle, praline, nougat, halva, fruit jams and jellies. 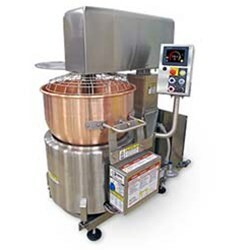 We have many different agitator designs for specialty products such as cooking and coating nuts, rice crispie treats, caramel corn, nutrition bar mixtures. Virtually anything that requires controlled cooking and mixing without burning, the FireMixer can do. Special design agitators to stir and caramelize nuts, coat caramel corn, blend rice crispy treats, and more!